All round trail performance. 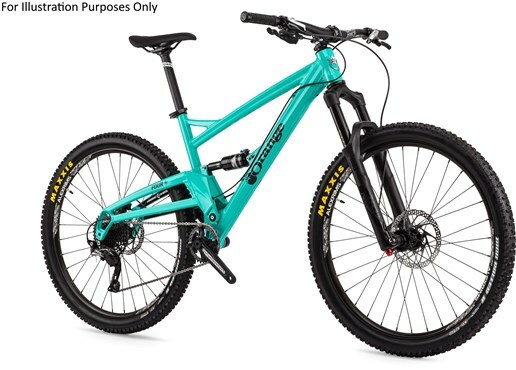 The Orange Four S is a short travel full suspension trail bike that rolls on 27.5” wheels and is built to be fast, fun and capable on the climbs as well as the descents. Faster and lighter than big hitting trail bikes yet more capable than an XC steed, the Orange Four is the ultimate short travel trail bike. Progressive geometry offers confident handling on every trail. The rear swing arm is compact which allows for short chainstays for improved climbing ability and manoeuvrability. The long top tube is combined with a short stem and slack head angle which keeps the wheel base long for stability at speed and fast, direct handling characteristics. The aircraft grade 6061 aluminium frame features CNC machined detailing which keeps the frame weight low while keeping things stiff and strong. The split design rear swing arm also shaves off a few grams and, combined with the 12x148 Boost hub spacing, adds rear end stiffness. All these marginal gains, or rather losses, add up to an extremely lightweight and capable frame. 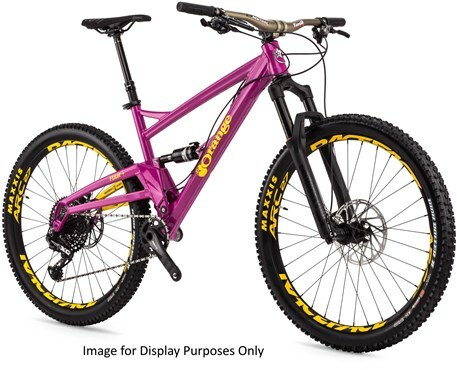 The 120mm of rear wheel travel is controlled with a compact RockShox Monarch shock that offers efficient performance on the ups as well as the downs. The Four is optimized for a 130mm travel fork which allows you to run slightly more front end sag for that plush ride feel. The RockShox Yari RC also features Boost hub spacing for a stiffer front end. Being an Orange you also get the opportunity to upgrade the shock and fork as well as other components. The Shimano SLX 1x11 speed drivetrain offers a wide range of gears with reliable running on technical terrain while the Shimano Deore hydraulic disc brakes offer confident stopping power in all conditions. Internal dropper post routing allows for easy seatpost upgrades. The Orange Four S is built to perform at the very highest level. Rims: Formula + Alex MD23 27.5"